20 | February | 2010 | Through the seasons before us..
Billy: Let’s reclaim the Lower Bridgford end! It has gladdened my heart today to read Billy Davies’ comments in the Evening Post regarding the City Ground, and how Forest don’t do themselves any favours in terms of away ticket allocation and placement. I suspect my bugbear on this subject may predate my guise as the blogger to the extent that I’d long since given up complaining about it, since the powers-that-be at the club have always seemed so non-plussed and are motivated by an over-draconian safety officer and, of course, the opportunity to make a few quid. In a nutshell, Billy wants the Lower Bridgford end back for Forest fans, and he’s damn right too. Putting a concentrated away following of up to 4,600 odd supporters in the loudest bit of the ground is a barmy notion. Particularly, as the wee fella also points out, when we are happy to give up all of those tickets to teams that give us paltry allocations (see Derby, Newcastle etc for example). Whilst it might have a negligible impact on results, surely even that negligible amount should be used to our advantage? Reducing away allocations enables more thought to be given to relocation – and given that T block in the Brian Clough stand is generally kept empty aside from in-demand games, that would seem the sensible option. I’m not sure whether that will be sufficient for the minimum amount of away tickets we need to issue – so maybe the block next to, or above it, would be suitable. This keeps the away fans in the right vicinity outside the ground near where their buses go. The only turnstiles for home fans near there are the Upper and Lower Bridgford, much like now. I really hope the board take Billy more seriously on this matter than they have their own supporters in the past, I have heard it raised more than once at fan’s forums and suchlike only to be summarily dismissed due to flimsy-at-best safety considerations. Considerations which, of course are laudable, but not insurmountable – and seem considerably more excessively restrictive compared to the majority of grounds I’ve visited around the country – and I’ve visited the majority of them (in league terms at least). This is just another example of Billy’s no stone unturned approach – any advantage, any angle – he takes it – it’s brilliant, and he has my full backing. 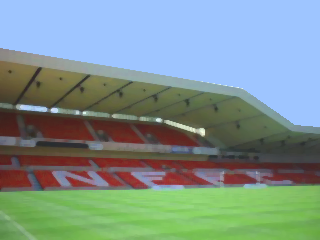 Imagine if we opened up the Lower Bridgford end for Reds fans and packed it with our most vocal fans – we could actually make the City Ground a pretty intimidating place to come and nullify the impact the away supporters can have, which is massive at the moment (and given our recent run of results at home, could make us even stronger!). Bravo, Billy – keep fighting the good fight! On another note – I’m on the beers before and after the game today so the Middlesbrough match report might not make it ’til Sunday (or be full of even more spelling mistakes than usual! ).